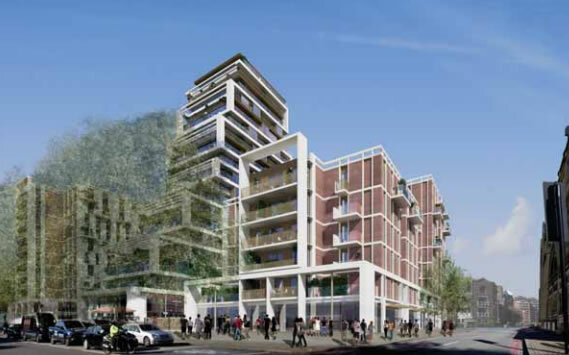 As expected, planning application 2015/0881 to demolish Homebase on 198 York Road, and replace by 6, 7, 9, 11 and 21 storeys to provide 254 residential units, has been recommended for approval by planning officers. Amendment was received comprising the replacement of the commercial uses for a dance academy at ground floor level with additional floor space and an increase in height to the buildings (thus 21 storeys instead of 20). However, in their report, the planning officers justify the breach of policy as “this taller scheme can be supported from a strategic perspective subject to demonstrating significant planning benefit” (p25). Although the officers point that these proposals run counter to Council policies, a point also made by the Design Review Panel, the seem to leave the general issue in the hand of the Planning Inspector currently reviewing Wandsworth local plan. And it is not only only noted in one sentence over the 80 page report, but the decision on granting the permission is meant to happen on the 14th July, when the local plan examination hearing has not finished yet but months ahead of any opinion that the inspector could possibly express! and concluded “the Panel did not feel minded to support the proposal as it stands“. To spare you reading the 80 pages, I would summarize on saying that all issues and breach of policies have been brushed off with the benefits of the venue provided for the Royal Academy of Dance (currently located in Battersea Square). 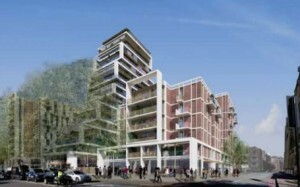 In what looks like a copy-cat of the developer’s advertising brochure, the officers’ report says : “The RAD as an occupier would undoubtedly add lustre to the area and could provide the centrepiece for a new cultural district attracting visitors and further investment to this part of the borough“. Therefore, while we are supportive of the development of this site and of the move of the Royal Academy of Dance (RAD) to this site, we maintain our earlier objections to the scheme.